The Vanir are a tribe of gods separate from the Æsir, and come from the land Vanaheimr, also known as Vanahiem, one of the nine world realms in Norse mythology that make up Yggdrasil. In contrast to the Æsir, the Vanir gods are only attested in the Poetic Edda, the Prose Edda and Heimskringla, and in some skaldic poetry. We know very little about the Vanir, except that in the myths, they waged wars against the Æsir in ancient times, who it seems were trying to edge in on their territory. Alternately, the Æsir mistreated a Vanir ambassador, the witch-goddess Gullveig, and sparked the war. Either way, it was eventually determined that neither side could best the other. Peace was struck between the two enemies, and hostages were exchanged to solidify the peace treaty. The Vanir sent three of their finest – Njörðr, Freyr, and Freya. In exchange, the Æsir sent Óðin’s brother Hœnir, a great warrior, and wise Mímir. In some stories, the Vanir also send Kvasir, the god of eloquence and poetry, but the usual story is that Óðin created the god from the spit of the two tribes used to seal the peace. The Vanir made Hœnir a jarl and gave him land; however, at all important meetings, he was indecisive and continually deferred to Mímir for advice. Feeling as though they had been cheated, the Vanir beheaded Mímir and sent the bloody message back to the Æsir. It’s not recorded how the Asgardians responded to this, but it’s clear that the peace held. We do learn that Óðin preserved the head with magic so that he might still have its council, and set it to guard the well of wisdom, Mímisbrunnr. Njörðr, god of the sea, merchants, and wealth. Freyr, son of Njörðr. God of fertility and abundance. Freya, daughter of Njörðr. Goddess of fertility and love. Gullveig, a mysterious woman tortured and killed three times by the Æsir. Attested in the Poetic Edda. Nerthus, goddess of water. Sister of Njörðr attested to, but not directly named in the lore. Following divine sibling pairings, Nerthus is the feminine version of Njörðr, and the name has stuck in many circles. There are also a few gods who have been speculated to be of the Vanir. Kvasir, as mentioned, is sometimes sent as hostage to the Æsir, though the majority of the lore weighs in on the side of Óðin creating him. Either way, he stands as a symbol of peace within the Æsir family until his death. Heimdallr is usually described as living in Asgard, but his parentage is mysterious. We know that he has nine mothers, but his father remains a mystery, and he has several traits in the lore which are symbolically Vanir traits. Ullr is another of the gods with a named mother but no father. He also has characteristics in common with the Vanir, being a god of food via hunting, and the rugged, uncivilized wilds, and who has been attested as having ruled them for a time. The Vanir who join the Æsir are thenceforth also referred to as Æsir, just as any Jötnar who join the pantheon are. There are no attestations of this working in reverse with the Vanir, or of any Jötnar joining the Vanir ranks. Njörðr and Freyr both marry giantesses, but they are all included in the Æsir family and reside solely in Asgard. While the Æsir take a vested interest in humankind, the Vanir do not seem to do likewise, and after the initial introduction to them, they are absent from the myths. Only the Vanir who join Asgard are seen to benefit Miðgarðr. Vanaheimr does not appear to fall at Ragnarök, and Njörðr even survives and returns there after the final battle. The Vanir are usually considered the gods of fertility, earthly abundance and material prosperity. Whether they were once an actual tribe of people, the gods of an ancient culture, or originally created close to the forms we know them in, they present interesting ideas and make a perfect foil for the tribe of the Æsir, who are associated more with the sky and war. 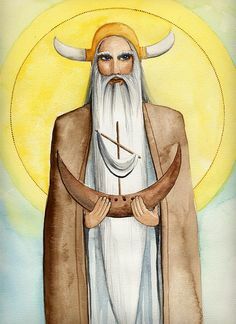 There are some theories which connect the Vanir to the elves, and it is actually attested that Freyr is given the realm of Álfheimr to rule. His worship is tied to burial mound culture and the “elves” as people knew them back in the time of his veneration were actually the spirits of the dead. This would suggest that the Vanir were symbolic of our own ancient human ancestors, and the ship burial customs tied to Freya and Njörðr also support this. Freyr’s Temple at Uppsala, in Sweden, was a major centre of his worship as a lord of the mounds, marked by pilgrimages and sacrifices every nine years. Still another theory describes the origin of the Vanir as Mediterranean sea gods whose influence crept up through the North. Similarities between the known Vanir and these ancient deities, such as Freya and Ishtar, point to this interpretation. The Vanir are very powerful gods in the Æsir pantheon, and are by no means diminished by their foreign origin in Vanaheimr. Quite the contrary – Freyr had influence at the height of Norse culture that rivaled Óðin’s. Vanaheimr may be immune the ravages of Ragnarok, as Njörðr is said to return to his home demense and survive the coming Apocalypse. Gold, brown, and green. Earth and good weather themes. Boats, ships, wagons and carts. Farming and fishing. Earthly abundance, celebration, physical pleasure, and blood sacrifice. Burials and funerary rites. Land, fields, meadows, shores and the horizon over the sea.